This tutorial will show you how to unlock the bootloader on the Asus Transformer Prime TF201 Tablet, running Android 4.1.1 jellybean, along with backing up your blobs and enabling nvflash. You can just unlock the bootloader and happily go about flashing roms, however if you brick your tablet you have no way to then recover. Now that the AndroidRoot team have given us the tools required to gain access to our blobs and nvflash we would be silly not to back them up at the same time. If the worst did happen and you brick your Transformer Prime TF201 at a later date, you can then recvover it and are not left with an expensive paper weight. The information in this tutorial is based on the excellent work by the AndroidRoot team over at: https://www.androidroot.mobi/pages/guides/tegra3-guide-nvflash-jellybean/ I have simply covered the whole process from the initial unlocking, to backing up our blobs and finally gaining nvflash access. In this tutorial i use Windows 8, however you will be able to follow this perfectly on Windows 7, and earlier versions of Windows too. To get started we are going to unlock the Transformer Prime TF201’s boot loader, this will allow us to flash custom roms and recovery images, so lets get started. Download the UnLock Device App V6, unzip this and then copy this to your Transformer Prime TF201 internal memory. Install the APK like you would any other app. This is where you could either be happily on your way, or waiting for the Asus servers to respond for hours, weeks or even months going by what some people have said on the XDA forums. I kept getting a network connection error trying to unlock my prime, my network connection was fine. Apparently this is an extremely common, and annoying problem. After a lot of messing about I gave up, came back to my prime later and managed to unlock first time. You will be asked to verify your Google account password to unlock, if you have two factor authentication enabled you will have to generate an individual app password on the Google accounts settings website to enter here. 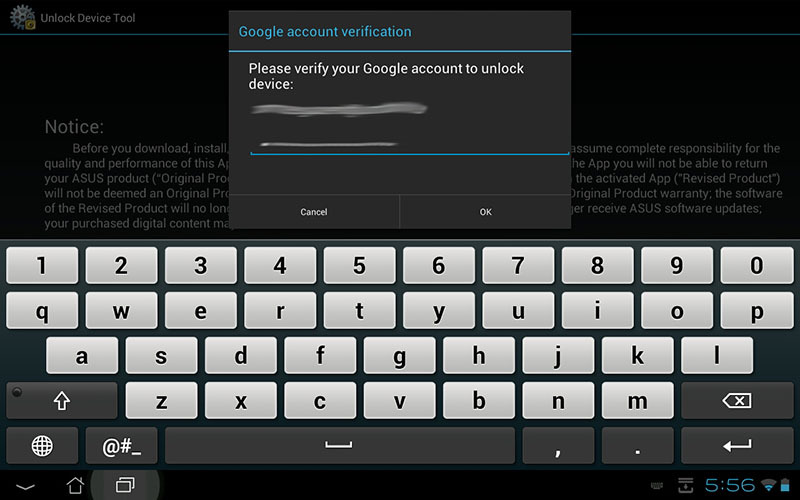 With two factor authentication your normal Google account password will not work here. All been well your device will re boot and unlock its self. From now on when your Transformer Prime TF201 boot’s you should see a message in the top left of the screen stating “This device is unlocked”. Now your Asus Transformer Prime is unlocked we have enough access to backup your blobs and enable access to nvflash, this essentially will allow you to recover your Transformer Prime if something really bad goes wrong at a later date, essentially making your Tablet un brickable. This also must be unzipped to the C:\fastboot folder too. Now switch your Transformer Prime off, hold the volume key down on the left hand side, and press the power button. You should now see the boot menu. Using the volume down button move along to the USB icon, then press volume up, you should then end up in fastboot. If you do need to install some drivers the Universal Naked Driver 0.72 worked fine on Windows 8.1 for me. I did however have to re start Windows in test mode to allow the unsigned drivers to be installed. Presuming you have drivers installed and are now ready to go Open up a Command Prompt window in C:\fastboot, to get to C:\fastboot you can type “cd C:\fastboot” without the quotes and press enter. A blue bar will also be shown on the Transformer Primes screen indicated that flashing succeeded. After the flash process has completed you will need to reboot your Transformer Prime TF201 into recovery mode. It is important that you reboot completely rather than directly enter recovery. If you don’t there is a risk that this process could fail. Note: this process could brick your device, so remember you are doing so at your own risk, i will not buy you a new tablet if you brick it. The Transformer Prime TF201 will power off. Power theTransformer Prime TF201 back on and allow it to boot normally into Android. Once the device has fully booted please turn the Transformer Prime off, then reboot the device back into recovery mode. This will generate your nvflash blobs and if a wifi connection is able to be initialised, it will upload the blobs for safe keeping to the AndroidRoot webserver (there is nothing confidential about your encrypted nvflash blobs). After blob generation is complete, please follow the on the screen prompt to retrieve your blobs from the /data partition. It is important you back all these files up in multiple locations, do not loose them. If you brick your prime it will be your only way to recover. To use Nvflash reboot your Transformer Prime into APX mode, this is done by holding down the volume up key when powering the Transformer Prime on. If successful the screen should remain blank and be detected over USB by your computer as an NVIDIA APX mode device. If you have Windows 8.1 you will likely need to go to device manager and install the Universal Naked Driver 0.72 for the NVIDIA APX mode device. If successful the Transformer Prime TF201 will boot into nvflash mode and the bootloader screen will appear on the device. Store these backup safely along with your blob files. That it, you have now unlocked your Transformer Prime TF201, and created the relevant backups to recover your tablet with Nvflash in the event you accidentally brick it. I have simply tried to document everything, including the initial unlocking of the Transformer Prime from start to finish, with screenshots and detail to allow a less experienced user to complete the process with confidence. Nothing here would be possible without the hard work of the Android Root team. Hopefully my experience of unlocking and preparing my Transformer Prime TF201 for custom roms has given you the confidence to do this with your own tablet too. Sadly Asus have not issued an official update for the Transformer Prime TF201 since my guide on How to Root Transformer Prime TF201 After Jellybean 4.1.1 Update, which i wrote well over a year ago now. I think its safe to say if we want newer versions of Android custom roms are now a must. Now we can backup our blobs and access nvFlash i thought this was a good time to finally unlock my prime, given the only benefit to keeping it locked was OTA updates from ASUS. This is something that gets asked a lot in the comments, i cant personally share my experience with unbricking the Prime TF201 as i have never bricked mine, and dont intend to try and do so. However i did contact someone on the Android Root Team as to why no information was available on recovering from a brick, basically depending on the brick they could be several different things that need to be done, so the Android Root team recommend you contact them directly for assistance with unbrcking. We purposely left out the advanced guides as we feel it’s just not possible to write something generic. In most cases, people tend to mess things up more when following random unbrick guides. So with that in mind install an IRC client (mIRC works well in Windows) then connect to freenode.net and join #asus-transformer. My only concern is the Android Root Team might not be around forever… so if someone ever does go through the unbricking process i would personally love to see a blog about this. 1. To use Nvflash reboot your Transformer Prime into APX mode, this is done by holding down the volume up key when powering the Transformer Prime on. Initially I missed “this is done by holding down the volume up key when powering the Transformer Prime on”. Be aware that these are – which are (accidenty) displayed/changed to –. Use the text on the screen-dumps instead or update the commands with — after you paste them in the command box. Glad to see you have been successful, I was just about to reply to the message you sent me. I will see what i can do about the changing of the – in the blog post, cheers. TYVM for this simply step by step guide… Having bricked a tablet in the past I was looking for an easy to follow guide to taking the right precautions before fiddling around. Thanks! I think many people gave up unlocking their tablet due to a lack of perseverance with the unlock tool – took me days of trying before it unlocked – Asus, a mostly incompetent company who have provided shockingly poor service for Transformer Prime owners. I had my prime connected with a USB Ethernet adaptor updating my apps. After that finished I then tried to unlock the prime, however the unlock tool told me it could not find a network connection. So I disabled the Ethernet adaptor in the primes settings menu, disconnected it, enabled Wi-fi again and ran the unlock tool. I was then able to unlocked the tablet first time. I have no idea if I got lucky, or if that actually helped in some way. going by what i’ve read on-line I appear to have been extremely lucky to unlock mine later the same day. So naturally I have been unable to progress further. Are you able to advise what’s wrong? Have you typed the command as shown in the screenshot, it appears copy + pasting can case issues as Jørgen mentioned a few comments above you. 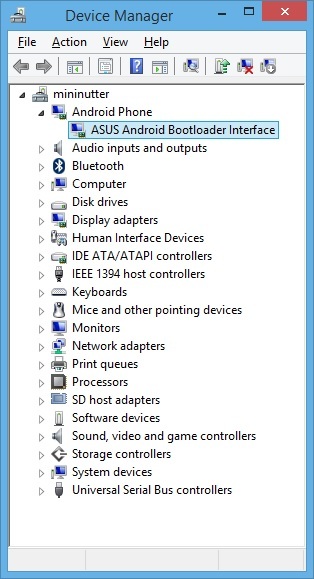 Something else you can also do is go in to device manager and check that the drivers for APX mode are installed. You could well have to install the Universal Naked Driver again as your tablet will be seen as a different device by Windows. Thanks Matt, not sure why but when I tried it again the flash worked. So continued to follow your instructions until the Generate Wheelie blobs, however when I tried to do C:\fastboot type adb pull /data/media/AndroidRoot, I got back a message saying device not found. I checked the device manager on my pc and its showing up under ‘other devices’ and saying drivers for this device not installed. However it was working fine earlier. So I have the prime at this point (also showing failed to enable wifi) and the last line as DONE! How did you fix this? I’m stuck at this point as well. How did you get past this point? 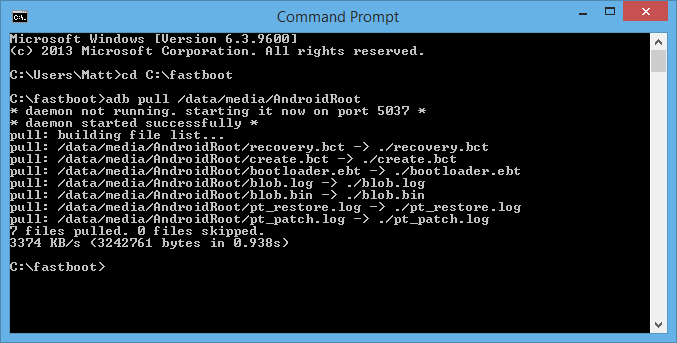 C:\fastboot type adb pull /data/media/AndroidRoot I didn’t capitalize the letters A and R of AndroidRoot. This also caused a problem. Be sure to enter the command exactly as shown with lowercase and uppercase letters. Hi there, I just run through all your instructions and also got Dax’s error. I tried several times, do uninstall/install driver again without no more success and suddenly I tried by disconnecting and reconnecting USB ASUS cable and it worked!. It seems that USB connection goes in a “sleeping” status after a while, so just be ready to type fastboot command upon USB connection. You made a great job, Matt. SUCCESS….Great instructions Matt, I managed to get through it in one piece and without bricking my prime. Now I can go and install Androwook Hairy bean and hopefully I’ll have a prime that runs like it did when I first got it…or close to. Excellent, glad everything worked as expected! I’m on the unofficial CM 10.2 rom which is Android 4.3.1. Loving it so far, especially the ability to have multiple users each with their own apps and settings. I personally think it’s such a huge improvement over the Asus 4.1.1 rom, the tablet honestly feels faster than it did when brand new. I checked spelling of the files multiple time and also did the thing in the wheelie menu again and downloaded the files using adb again. Now that I have unlocked my TF201 and have some files I presumably needed to unbrick my tablet I was ready for the next step: an custom ROM. As I was a bit flabbergasted by the zillions of instructions and ROMs I finally decided to attempt to install “Androwook Hairy Bean” running Android 4.2 that includes my much desired User Profiles. Taking a deep breath I jumped in and downloaded the “Upgrade Hairybean 4.2.1 Bootloader & Recovery.zip” (eventhough I wasn’t ‘upgrading’). I booted in Old Android and copied the this ZIP-file (Upgrade Hairybean 4.2.1 Bootloader & Recovery.zip) in the root folder of TF201 (Flatline couldn’t mount my SD-card). I rebooted TF201 and used the VolumeDown+Power trick to get back into Flatline. Used VolumeUp + VolumeDown to get to [Install ZIP from SDCard] and pressed the Power-Button to activate this menu. I moved the cursor to point to the [Upgrade Hairybean 4.2.1 Bootloader & Recovery.zip]-file and Installed (sorry don’t exactly recall actual button I pressed). This worked out fine, I presume I have flashed the bootloader! Go to Install options and flash “Hairybean 2.2.zip” from Micro SD card. Thanks for the instructions Jørgen. I was beating myself up over why I could not install Hairybean since I could not get to my microSD card. I have downloaded the fastboot file but there is no “flatline_tf201.img” contained within. So when i get to, “Type fastboot -i 0x0b05 flash recovery flatline_tf201.img” I am not able to proceed. You need to download Flatline for the Transformer Prime, which is linked to just below where you download Fastboot. This also must be unzipped to the C:\fastboot folder too then you have all the files required. Copy and pasting it will not work. Can some one point what to do? Hi Carlos, I’ve been getting the same error – how did you overcome it? It’s been driving me mad! I have managed over come the previous error. So no need to reply. My problem is getting windows to recognize my prime in APX mode. I have the same problem. I’ve tried on 3 different computers (Win XP, 7 and 8.1) and they all didn’t recognize the universal naked driver in APX mode. Do you have a solution for that Matt? Not sure if the drivers are designed for Windows XP, however in Windows 7 and 8 / 8.1 you need to disable the checks to install unsigned drivers. In Windows 7 it’s simply a case of opening a command prompt as an Administrator (right click and run as admin) and typing bcdedit /set loadoptions DDISABLE_INTEGRITY_CHECKS after that re boot and you should be able to install the drivers. I’v tried this on windows 7 it doesn’t work. What do you actually see in device manager when the prime is in APX mode? posting a screenshot might help. My OS language is dutch so I’ll trie to translate but how can I post a screenshot? So if you right click on the Unknown Device, select update driver software and browse to the folder which contains the universal naked driver will not then install the driver? If not try first selecting the i386 folder (if you have a 32bit OS) or the amd64 folder (if you have a 64bit os) and see if the driver will be then recognised and installed. I don’t know how I did it but at last my computer saw an APX device and then I could install the drivers. Many thanks for your help and this blog. Hi, finally i solve my problem is getting windows to recognize my prime in APX mode using something like you have point to Disable Driver Signature Enforcement. One thing that happened to me is to plug the tf201 into the pc when i put it in apx mode, so windows find some apx device. Another thing is when i past the commands you refer for creating the blo is to replace the charaters – with new ones (seems strange but works). Anyway thank you for the great guide to backup me tablet. Well, the procedure stop right there! FAILED ! Some one have tricky with this ? I need to apply ” fastboot -i 0x0b05 flash recovery openrecovery-twrp-2.6.3.0-tf201-JB.blob” , before this procedure? Hello. I have a 10.4.2.18 bootloader into my TF 201 to. Is this guide is valid for this version? Should I make downgroade to 10.4.2.15 before prepare recovery? But how? Is this solution: “fastboot -i 0x0b05 flash recovery openrecovery-twrp-2.6.3.0-tf201-JB.blob”? Where I can find openrecovery-twrp-2.6.3.0-tf201-JB.blob? I then reboot, and i do not get the RCK option. Awesome tutorial. But I need a little bit more help. What is next step after this guide? Can I use for this Flat Line? Or will I need TWRP? Which ROM do you setup on yours device? And “how” step by step setup it after this tutorial? Thank you for the tutorial, excellent work. In case we would need to recover is there an similar guide for recovery? Also which ROM would you recommend and is there a guide for that? Hey. Lets assume I’ve bricked my device. How do I flash everything back to normal and what exactly do I need to flash back? Hi there! Tutorial is very good, flashing went well. But I’d like to know too, how I recover the backup I made as in the tutorial so it gets like it was before the flashing. Thanks a lot for further help. Hi, thanks for the great guide. I followed the process and got a good result. One comment though, without the instructions on how to use the generated and saved files I have no way of knowing how to recover from a brick. I’ve since bricked my TF201 and am desperately trying to find a guide on how to use my recovery files! Could anyone direct me to or, if you have the knowledge, create a recovery guide, thank you. I dont have my tablet with me to try at the moment, however read the part of the tutorial “Using Nvflash” and follow it, when you come to the part on typing wheelie –blob blob.bin can you boot the tablet? if so enter the recovery and try flashing another rom. Couple of problems with that advice….I can start the tablet using “wheelie -blob blob.bin” but can’t enter recovery, and even if I could there’s no way to load a rom to the sd from there. So only way to recover is to use the backup files that I created using your guide, and I can’t do that without the correct code and sequence to use from within nvflash, wheelie etc. I, and I’m sure many others would be gratefull to anyone who knows how and is willing to post a guide to recovering using nv flash and their previously generated files. I see, it obviously doesn’t work how i presumed it would. Having not bricked my tablet its never something i have been able to share my experiences and blog about. I have however sent an email to someone on the androidroot team (who created Flatline for our primes) asking about how to recover if you do happen to brick your prime.I will post back when i get a response. Thanks Matt, I appreciate your efforts, I hope it works out. Wheelie can recovery all non-hardware bricks, however, the regular wheelie bootstrap mode requires certain parts to be correct, namely the partition table and the BCT (ram settings and stuff). Without those, it fails to boot. It’s pretty rare people break those however because it requires quite a bit of effort. I think the best thing to do would be to install an IRC client (mIRC works well in Windows) then connect to freenode.net and join #asus-transformer. It sounds like you will get the support you need there. Thanks for the advice and help. I’ll follow it up. Please do let me know how you get on, ill be interested to know. All good now thanks to @RaYman, @kmdm and Flemmard at the above mentioned. I’m very relieved and gratefull to all that have helped me recover my bricked JB prime. Currently running a deodexed and lightly modded,rooted stock JB ROM and very happy with it. 2. 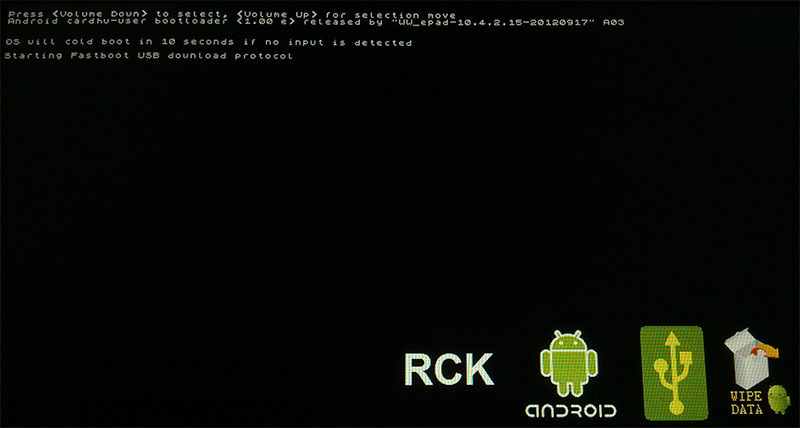 After a full restart I boot back into the boot menu and select RCK, and I get a little android lying on his back with an exclamation point in a red triangle above him and it goes on to boot android. It would seem the recovery image doesn’t actually exist on the tablet. I notice that you mention seeing the device as an APX device, yet no screenshots show anything indicating an APX device. When i attached my device is was recognized as an ASUS Android Bootloader Device and try as i might I can’t find anything that says anything about ‘APX device.’ I attempted to uninstall the drivers and remove the software so I could install the naked driver, but the system just re-installed the ASUS driver. I’ve tried this on two different windows 7 systems with exactly the same results. What am I missing? Next step is to install a custom rom ! Congrats on creating your backup files, I did the same. Beware! Thinking I was now safe I flashed a new rom which went wrong, I ended up bricked but thought, no worries I have my backups. But without a guide on how to use them I can’t recover my prime. So I wouldn’t rush into flashing a fresh rom utill there’s a guide posted on how to use your recovery files. You may end up in my situation with a bricked prime and no one willing or able to advise on how to recover. I’ve tried 6 times so far, and of course “the remote object does not exist”, so I’m a bit stuck! I have fixed it – *after* asking for help of course! It wouldn’t enable wifi, or upload the files, so I rebooted the prime, navigated to the Androidroot folder and emailed them to myself. It wouldn’t let me send them all in one email, so I had to do each one separately. I also tried to copy them to a new folder, and move that folder to my desktop, but the resulting folder on the desktop was empty each time. I also had this problem. Then I realized that you need to type the adb command exactly using a capital A and capital R in the word AndroidRoot. I hope this helps someone. Thanks for the excellent step by step write up. It has helped me understand tremendously! By unlocking the Prime with UnLock Device App V6, will it wipe my device? No the unlocking process didn’t wipe my prime, however you should always backup before doing anything like this regardless. Hi Matt …nice write up …got mine all working fine now running HairyBean v 2.31 ..had issue with APX under Windows 8.1 and never got it to work on that pc …so used my other pc which runs Vista and that installed APX drivers without an issue . Only thing i would like to know is —- if i did brick my TF201 in the future …how do you restore it using nvflash ? Glad everything went smoothly for you! A lot of people have asked me about unbricking, i have basically updated the first post with some info on why you will need to contact the Android Root Team about that. It’s not ideal, however they do feel its the safest options. Windows 8.1 is an absolute pain with unsigned drivers, i had no trouble with my prime, however i recently unlocked a mates HTC Sensation and flashed Cyanogenmod to it. I just could not get the drivers to work with Fastboot under Windows 8.1, booted an old Netbook which is running Windows 7 and everything worked perfectly with no messing about. Enjoy your new and improved prime, multi user support is worth unlocking for alone! Ow i will lol ….again ,thanks for the writeup , best one on the net i say for unlocking and nvflashing . Work around the wifi issues. Connect the tf201 to your pc and get the files “manually”. WiFi upload is just a convenient unnecessary bonus. did you find a fix for that issue im running into the same thing. Just save the blobs, connect PC to the tablet and get them. Hello Matt, I have enjoyed reading your post. Recently I was trying to flash an updated ROM to my TF201. After installing the ROM it rebooted and now hangs on the initial screen. In trying to fix this using ClockworkMod Recovery I must have messed up the partitions because now when I try to install zip from sdcard it will sat that it can’t mount /sdcard/. I can access it through APX mode on the computer but I need the blob.bin file to proceed. Can I download one just to get the process started, the one I am using hangs up searching . I would greatly appreciate any help you can provide. Thanks for sharing this. I Am half way there. I found link below on how to unbrick, but will keep in mind going to irc chat first just to make sure. Hope I never need to use it. I installed and ran the unloack device app v6 on my TF201. I acknowledged and ran it sucesfuly. It rebooted and i say it said unloacked on the uper left corner and then shutoff. since then i have not been abe to tunr it back on. i have held the ower button down and after 10 seconds it makes a vibration buzz but wil not turn on. i also held the down volume button and power button at the same time and after 10 seconds only the short buzz. Any suggestions? I tried going into the mIRC chatroom you mentioned but no one answered my question. Anny suggestions or sep i may have missed? Sounds like the battery might not be not charged to me at a random guess, i know when my primes battery have gone it will vibrate and do nothing. Seems strange it has done that when you used the unlock app, its kinda hard for you to do anything wrong with that as you just run the app and let it do it’s thing. Hi Matt – I’ve got as far as downloading NvFlash ready to boot. When I reboot into APX mode the computer detects the device as Asus Transformer Prime APX Interface. Can I proceed or do I have the wrong drivers loaded? Yes that’s fine, if you had the wrong drivers it would likely be an unknown device. Matt-I wanted to thank you for you tutorial in advance however I am stuck on the nvflash step. I can not get past it. when I push the volume up and power on the device manager pops up with “samsung andriod phone” under it it says, “Asus transformer prime APX interface”. However I can not seem to get the wheelie -blob blob.bin to work. I get the same message as others “failed to open blob.bin. Matt-Nevermind, It’s complete! All worked as described. Thanks a lot! thank you very much this worked great!! First off, I would like to thank you for this excellent tutorial. I however, seem to have managed to mess something up. My 3 final nvflash files wouldn’t transfer. Following this, my usb port is no longer working. My prime says that usb is not connected and all 3 of my computers won’t even recognize it when it’s connected. I apologize for my screwup but I could really use you help. Thanks again. Is your prime recognised at all when you are running Android? either as an unknown device in the Windows device manager or anything else? I’m sorry for my late reply. My prime isn’t recognized anywhere on my pc. You need to flash a recovery capable of flashing KitKat roms such as this: http://forum.xda-developers.com/showthread.php?t=2595531 after that you should be able to flash any 4.4 rom fine. At the moment you can only flash up to 4.3 roms with the current recovery you have. Hi, I’m just wondering, how to restore from the backed up files. I did the transition to CM10 and it works perfectly fine. It’s just that I want to sell my Prime and for that I want it back to how it was. That’s what I did the backup for, right? It’s not bricked or anything wrong with it, it’s unlocked and I can access the recovery menu (holding volume down and power on). I just don’t know how to restore the backup files. This backup is simply for if you happen to totally brick the prime flashing a custom rom, it will allow you to recover from that. If you want to restore the prime to how it was when you got it, then you need to restore the backup of your factory rom, presuming you made one before wiping and flashing a custom rom. Thanks Matt for the link, I’m going to check it out. 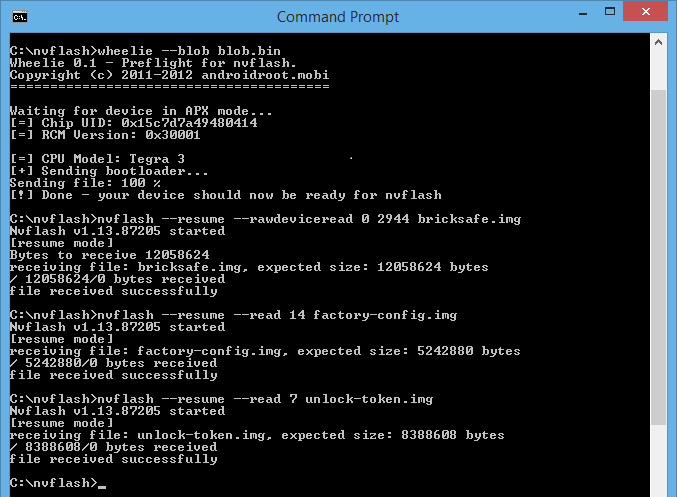 Hopefully it’s going to work as smooth as flashing CM10 with this step-by-step manual! Hi, its happened to me also… did you find a solution to this? Thanks, I just completed all the stages and still get from TWRP: “root is required for this app”, what am I missing? All i can say is keep trying, it took me a fair few attempts to unlock it. The Asus servers are very poor, try at different times of the day and they might randomly be working. A good and detailed step by step method described here. However I am facing a diff issue when I was trying to follow ‘Urkel’s Fresh start method.. This is basically the error where I have extracted the blob file from the asus original firmware on the website and using Urkels method to root the tablet..I have also successfully unlocked my bootloader.. However since the method has already wiped my cache and user data and maybe the firmware..the tablet now wont boot beyond the ASUS logo in normal mode..I can still get into Fastboot though not the Recovery(gives me an unrecoverable bootloader error) when I select RCK from the menu. I dont have any NvFlash or blob copied..Please help.. If you can get in to fastboot you should be able to re-flash the recovery, then you can simply flash another rom. After that power your Transformer Prime off, then power the Transformer Prime TF201 on with the volume button held down, select “RCK” on the boot menu to launch the Flatline recovery. If you can get to the Flatline recovery then you can flash a new rom. Presuming you still have the files from my blog post, copy the TWRP recovery in to C:\fastboot, then open up a Command Prompt window in C:\fastboot, to get to C:\fastboot you can type “cd C:\fastboot” without the quotes and press enter. The TWRP recovery image should be flashed to your Transformer Prime, exactly the same as what you did with flatline. I am now running TWRP 2.6.3.0 as a bootloader. Last question. How do I determine if this is a JB or ICS bootloader? I assumed it would have said somewhere in the TWRP menu but I don’t see it. In future, when I want to upgrade the ROM (or bootloader version) I understand I’ll need to know which ‘flavour’ bootloader I’m currently using, correct? How do I know which it is? Hey Matt. Thanks for such a detailed guide. I have gotten to the point of using Nvflash but I am stopped at the command line “nvflash –resume –read 14 factory-config.img”. The bricksafe command worked fine but I’m getting an error “file create failed NvError 0x30010” and then it says read failed under that. Ok, I figured it out. I had to open my command prompt as administrator. Thank you so much.. I was having issues with the file transfer but I was able to reboot and backup the files and also the NVFLASH files.. saved them on dropbox/CD… Many many thanks!!!! I have not been able to determine this so far so I apologize if it is a off the wall question. My tf201 is running version 10.4.2.18 and I just unlocked it a week ago without issue using the ASUS apk. Can I use this method to get the recovery and backup my blobs with nvflash from the device safely? And then will be install custom roms after this. Yes go for it, just remember if you flash any 4.4 roms you need to flash a recovery capable of flashing KitKat roms such as this: http://forum.xda-developers.com/showthread.php?t=2595531 after that you should be able to flash any 4.4 rom fine. Will this work on 10.4.2.18? My Tablet still works fine, so i think its not a brick, but i cant do the nvflash :/ any ideas? Great to read description on something that i have decided to take a go at. Are they the same as in this post ?? Im currently on the latest Asus OTA update and its killing me how slow its become. Looking forward to any info to get me startet. In answer to Paul Bech, yes you can then upgrade both your boot loader and recovery, then move on to COMBRi-kk custom KitKat ROM made specifically for the Transformer Prime series. With Matt’s technique one never leaves the Jellybean 4.1.1 platform! Q1: Do need to uninstall SU before proceeding? I followed this to and it went well, now i need to know the above question. First of all amazing write up! I already made all the steps, but now I’m in the NVflash part. I installed the Naked Driver on win 8.1 (TF201 now can be detected as APX – confirmed). so I don’t know what to do next. Don’t worry I made it work… thanks! Type cd to change directory. 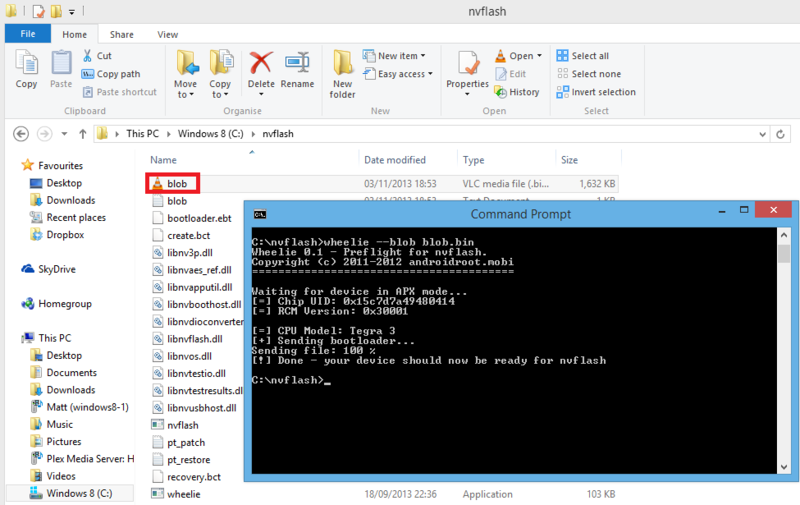 so for example type “cd c:\nvflash” without the quotes and command prompt will be then be in the nvflash directory. Hello I was having a tough time trying to Flash Crombi KK rom. At 1 point I had to use a recovery blob because I was stuck. I started from there upgraded bootloader and twrp 2.5. Flashed twrp 2.8 and Crombi KK rom kept showing fail. I eventually gave up and tried to go from 2.8 TWRP back to 2.5 with JB Bootloader. Bad move I know. Whenever I pressed up to go to recovery it would get stuck. Then eventually I tried wiping data from Bootloader screen. Now the 3 options, RCK, coldboot and wipe data wont show. Stuck at Asus screen “The Device is Unlocked”. Pingback: android karls castle apk | Full APK Updates for You! Pingback: [Q] How can I unlock TF201 with Android Version 4.1.1? Thank you Matt! This was a big help, everything worked beautiful without any troubles. I did all on Windows 8.1 64-bit and did not have any issues (except the wifi error). To everyone with drivers issues I would recommend to get a new USB3 to tf201 cable (I got this one: http://www.amazon.com/PWR-Charging-Transformer-Touchscreen-7n21135100344/dp/B008G2GBN4/). The original ASUS cable started to be little tricky and transformer would sometime connect as “USB device not recognized”. I tried to troubleshoot the driver issue again and again. Searched the internet, tried different tricks, but nothing worked. Until I replaced the cable. Then everything went exactly as written in this excellent guide. Matt, thanks again, I am now ready for KatKiss ROM Lollipop 5.0.2_r1 at http://forum.xda-developers.com/transformer-prime/help/katkiss-t2961256/post57227507#post57227507. If you have any experiences with it I would appreciate your notes! After trying for the last two weeks I’m still not able to unlock the tf201. I keep getting the “unknown error…” message. Any advice? All you can do is keep trying at different times of the day sadly. Some people have got unlucky and it’s taken absolutely forever to unlock. The Asus unlock servers are pretty poor sadly. crying shame that asus decided to cut update support so quickly. It’s a nice tablet. Problem solved. The issue was that the first attempt (last year) to unlock, root and install a custom rom resulted in a bricked tablet. After getting it “repaired” the Asus support still had it as already unlocked. A quick series of emails to Asus and I got this settled. The tablet is now running cm12 – Android 5.0.2. With each successive boot up it runs smoother. New life! Mike, your directions were excellent. Your tutorial worked great and things seemed to be going well: After “Step 1: Flash AndroidRoot BL”, boot into Android, turn prime off, then reboot into recovery.” Great. But in advanced / wheelie there’s no “Step 2: generate wheelie blobs” . I notice you have FlatLine CWM Recovery v2.0 RC1, where as when i wrote this tutorial version 1.0 was the latest. I’m thinking things might have moved about in the menu’s. I don’t have access to my Transformer Prime at the moment to flash this apparent newer recovery to confirm this is the case. Have you looked through the menu’s to see if that is now located else where? Hi Matt, I stumbled across this guide and thought I’d play it safe and follow it before jumping in and upgrading my TF201 JB 4.1.1 to CM10.2. Your guide was perfectly clear and I was able to back up all necessary files safely. Unfortunately – things are not so clear when it comes to putting all the pieces back together and returning my Prime to 4.1.1. I have found a few guides online but they are clearly for ICS only. I’m afraid that I’m on the verge of bricking things here. 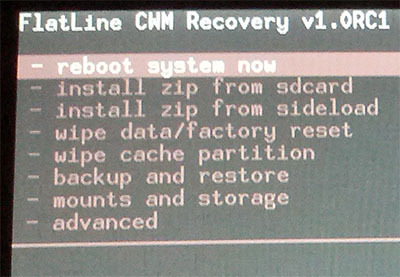 I can boot into CWM Recovery. So I still have access via FlashBoot, Wheelie and ADB – I have all my backed up files, I’m just stuck as my machine will “Can’t mount /sdcard/”. Any advice or directions to another guide would be great from you – or anybody at this stage. Have you restored your own machine? I never really covered flashing a custom rom or backing up your existing rom in this tutorial. Did you make a nandroid backup of 4.1.1 before flashing a custom rom? man i faild…. i think my root wasnt correct could it be? could be that i first rooted my tf and than unlocked it. but i got through till erase everything load zip from SD. i did that, it began to work and than gave me an error INSTALLATION ABORDED…. i donw know what to do now. i thought i id evereything to make my tf unbrickable??? i made it!!!!! I mean to unbrick!!!!! 😀 first i found this site http://forum.xda-developers.com/showthread.php?t=1927818 and thought that there could be a way to form the datas i have into those blob.EBT blob.APP and so. it might be cause i found that http://forum.xda-developers.com/showthread.php?t=1068548 but i didnt get it!!!! so i tryed to flash my bootloader.ebt instead the downloaded blob.EBT. it proceed my TF rebooted or should i say not!!!!!! after a while of trying to boot my TF i tryed if it works in apx mode. this worked. so as my last way i proceeded like said in the first link! and it worked. Great guide – but I think i have come accross a new variation of difficulties doing all this. I am on vacation at the in-laws, and trying to upgrade his tf201, but the keyboard literally burnt, when opened, there was a nasty smelling black spot on the keyboard side motherboard. Tablet side still works nice. Now the USB port is (was) in the keyboard. So i just tried copying files onto a mini sd-card, but holding vol down, + power does not present any options to access card. Are there any vacation brain level guides avail for advancing without USB, only using card? I dont think you would be able to totally follow this guide and make backups to recover the tablet if you bricked it, however you should be able to flash a custom recovery and in turn flash a custom rom with just root access. Once you have a custom recovery you can backup the stock rom to the internal storage / sd card before flashing a custom rom. Rom – Choose one from XDA: http://forum.xda-developers.com/transformer-prime/development you should be able to save to an SD card, or download using a web browser on the tablet, then simply flash from the TWRP recovery. You really would need to be careful though as if anything messed up you are limited with options to recover from it without a USB connection, especially without a blobs backup which i dont think you will be able to do without USB. I cant promise you the above will work, in theory you should be able to get a custom rom on the device though. Thanks for taking the time to reply. Your reply did indeed help, but in an unexpected way. I never really used the tf201, i just wanted to tune it a bit so it would last longer for my in laws. So only when consulting the Rashr pages, i saw in the video, that the normal charger cable was indeed also a USB cable, OMG silly me, very good laugh though. Then i could finish following the guide normally, and continue on to Android 5.1, which runs really well. When I completed “Step 1: Flash AndroidRoot BL” my ASus TF201 shut down and never booted back up. I have not been able to get into recovery or even the spashscreen. My lap does not see my TF201 because it won’t boot. I get a vibration when I hold down the power with or without holding down the volume. Is there any way to recover from this?? Help any and everyone!! Very strange,what happens if you hold the power button for 10-15 seconds? It’s normal the tablet will turn off after flashing, however i cant think why it wouldn’t turn back on or show the Asus splash screen. When I hold down the power button it vibrates after about 10 seconds and then nothing. No splash screen or anything. It was running 4.1.1 perfectly (as perfectly as that can be seeing that it is on 4.1.1) until I did Step 1 flash androidroot BL. After that it will not boot into recovery or anything. I’m still working on the old ASUS TF201. About 2 months ago, I wrote you — was stuck trying to get the “Advanced” menu in wheelie (per your instructions). I put the thing away, got it out and tried again. My goal to unlock, root, back it up via NVFlash – if possible – and then get a more current ROM onto it so it is usable again. So, now I have gotten as far as creating the 7 downloaded blob files, but I only have the first 5 files. No .log files. What does this mean? Can I try it again (should I try again) or is that a no-no? I so appreciate your help. recovery.bct, create.bct, bootloader.ebt and blob.bin should be the important files. You sould have enough to recover the tablet in case the worse happens. Yay, success! I was able to go forward without the .log files and wheelie worked great. I now have multiple copies of all those !important! files for my newest TF201. Now, on to getting a more updated ROM on this thing so it’ll be worth using (perhaps). Thanks very much for your hand-holding, wouldn’t have had the nerve without your help! One more thing, though, if I could bother you yet again. I believe I now have the .15 bootloader. What steps come next to get me ready to install TWRP and ensure I don’t have a bootloader/ROM mismatch? Reading all the posts on updating the TF201, can someone explain the main benefits, and also the downside, if any, also which version of Cyanogenmod to use. The tutorial seems easy and straightforward to follow. The benefits are you are on a modern version of Android, so can use some apps / features that will not work on older version of Android. In addition you get loads of nice addition configuration options that are present in Cyanogenmod and in general i’d say Android 5 looks a lot better than stock 4.1. Cons are bugs, i’ve never really found a custom rom which works absolutely perfectly on the prime, however most have been good enough for every day use. However i think as ive mentioned before i gave my Transformer Prime to my Mum to use so dont have it around to tinker with any-more, so cant say really say how good any modern roms are at the moment. I am hoping you can help me out, I am strugling to get past the fastboot stage. It recognizes the tablet with “fastboot devices” in Command Prompt, but then going to “fastboot –I 0x0b05 flash recovery flatline_tf201.img” still the same failure message / no such device. Portable Device — Transformer Prime TF201 and also SAMSUNG Android Phone — ASUS Transformer Prime USB Interface. There must be a simple answer, but I just cannot see it. Really appreciate any guidance you can give. When it shows “Transformer Prime TF201 and also SAMSUNG Android Phone — ASUS Transformer Prime USB Interface” try un-installing the driver in device manager, then installing the universal naked driver. 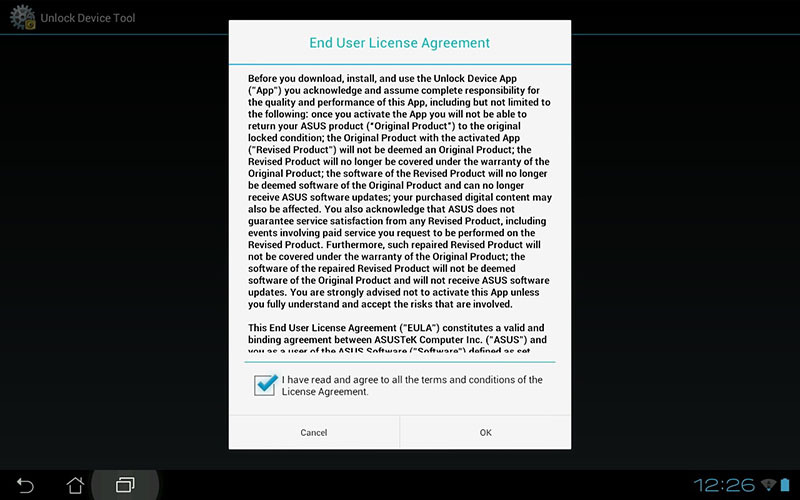 If you have had drivers installed for other Android devices in the past I’ve found they do conflict with each other. If you have installed other drivers for tablets / phone remove them all then try again. I just comment to say… ILOVEYOU! WORKED LIKE A CHARM!!! The USB I have, is not the original, and the cable seems thinner that the original, if that is the case, how can I ensure that I get the correct cable. When HairBean was installed it just keeps crashing or just rebooting itself. Have tried to reset tablet to original state, but methods seem contradictory or else do not seem to work. Ideally I want to go back to the original set up and start off from afresh. Hopefully I am not the only one to have a problem, as there seem to be many people who have successfully upgraded. If anyone can point me in the right direction to fo back to the original TF201 setup I would be really grateful. Many thanks for your posts and reply, it has taken a long time to finally install KatKiss, but finally it was successful. Having experienced many problems along the way, I went back to your instructions as far as Nvflash, then used the instuctions from Xdadevelopers. Some problems I experienced were probably with drivers, and also maybe trying to flash wrong files, but as I have two laptops, one Win7 and the other Linux, I was able to overcome these minor upsets. The tablet is now faster than when it was new, and a lot quicker in responding – well done for all your work. Power on the Transformer Prime with the volume button held down, select “RCK” on the boot menu to launch the recovery. Just just ensure its on the SD card and you should be able to re flash the rom from there. l would like unbrick my tf201. was succesful, but what next ????? I was going along fine, but wanted to try loading KatKiss on the machine … hey, I’ve got the safety net files, what could go wrong? Well, the initial attempt got me into a loop with no boot. I’d made backups through the TWRP bootloader so I thought I’d put those back and try again later … but now it won’t even get into TWRP and displays the dreaded unrecoverable bootloader error. I am able to get as far as seeing the device in fastboot … at least it looks like it sees it … I’ve got but haven’t tried flashing the flatline.img file yet because I’m concerned about digging myself into a hole I can’t get out of. There’s still a bit of light up there at the moment … I guess I’m just looking for a few encouraging words. Any chance of getting a bit of help here? Many thanks in advance! My (self-inflicted) problems are not your concern, but with the implication (hope) of being bricksafe, I did follow your procedures so far and it was spot on then … hoping for the best here again. Clearly the fact that I could access the tablet through fastboot was key, but the preparations laid out in the instructions here and the assistance of one more knowledgeable than I was extremely helpful as well. It’s great the Android Root team are still on hand to help out all these years later 🙂 i hope you manage to get the tablet running a more modern version of Android. Do let me know which rom you use how it performs once it’s all setup. Just seeking some clarification at the step “Step 1: Flash AndroidRoot BL, this will flash the AndroidRoot custom boot loader”, this completed with no errors but then at the “Power theTransformer Prime TF201 back on and allow it to boot normally into Android.” step, it first rebooted to the startup “ASUS” with a horizontal bar below with about 1mm of blue to the left. The blue did not increase to the right and after a minute or so it rebooted to the same startup “ASUS’ screen (the one with ‘The Device is unlocked’ at the top left) but does not progress. I was able to complete the rest of the steps so have nvflash installed ok, but it stills stops at the ASUS screen. I can access recovery and the nvflash. I am guessing this is the “harm your device” scenario for the wheelie install – but I am not sure what needs to be reflashed to where. I have spend some time on google trying to work out the answer but am not confident with what to do next. Any pointers would be appreciated. Do you happen to have the original un-blobbed ICS/ JB ROM zips? Thank you. I hope thats of some use.